On January 27, 2012, Dr. Ron Paul, Congressman and candidate for President, came to Bangor, Maine, and spoke for about 30 minutes to supporters and well-wishers who had gathered in the Union Street Brick Church. Although he was speaking in several other places in Maine, this was the furthest north, and so many of the several hundred supporters came from northern Penobscot and Aroostook County to hear him speak. I videotaped the speech, which defines well what it is he stands for and what he wishes to accomplish if he wins the election. You are welcome to share this video, but I do request that you attribute it to me and link back to NorthOfBangor.com. 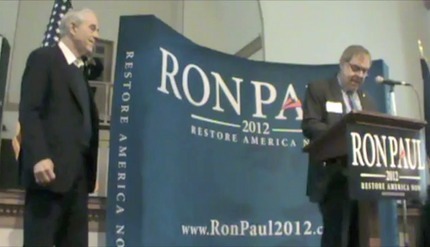 Dr. Paul's official campaign website, "Ron Paul 2012," is at RonPaul2012.com.